Visual Astronomy: Possible Jupiter Impact? "...My next thought was that it must be either a dark moon (like Callisto) or a moon shadow, but it was in the wrong place and the wrong size. Also I'd noticed it was moving too slow to be a moon or shadow. As far as I could see it was rotating in sync with a nearby white oval storm that I was very familiar with - this could only mean that the back feature was at the cloud level and not a projected shadow from a moon. I started to get excited..."
This theory, however, is still just that, a theory, as the observations have not yet been confirmed. 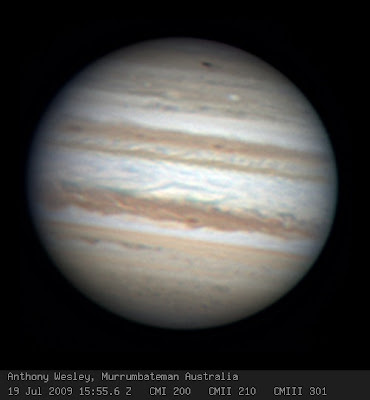 The image below was captured by Wesley using a 14.5" f/5 Newtonian telescope. Note the black spot at the "top" of Jupiter, which is actually the South Polar Region. Image captured by Anthony Wesley (Click for more details). On a side note, I've been noticing that Twitter is far more useful for quick spread of news than the big news networks. Most of the recent news (including this story), I've received from Twitter hours or days before the major news networks... Thanks @Discovery_Space! Looks like NASA has infrared observations on this event, and they're calling it an impact. More details here.